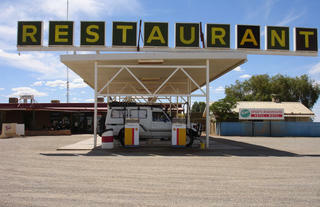 Located 170km nth of Port Augusta on the Highway to Alice Springs and Darwin. Just Spubs Roadhouse and Service Station there. On the Roxby Downs Rd turnoff to Nearby Woomera. An important space launch testing centre up to the 1970's. In 50s and 1960s a number of australian and british rockets were launched culminating in the launching of the Prospero satellite in 1969. NASA, West Germany and Australia currently currently launch data gathering rockets from Woomera.